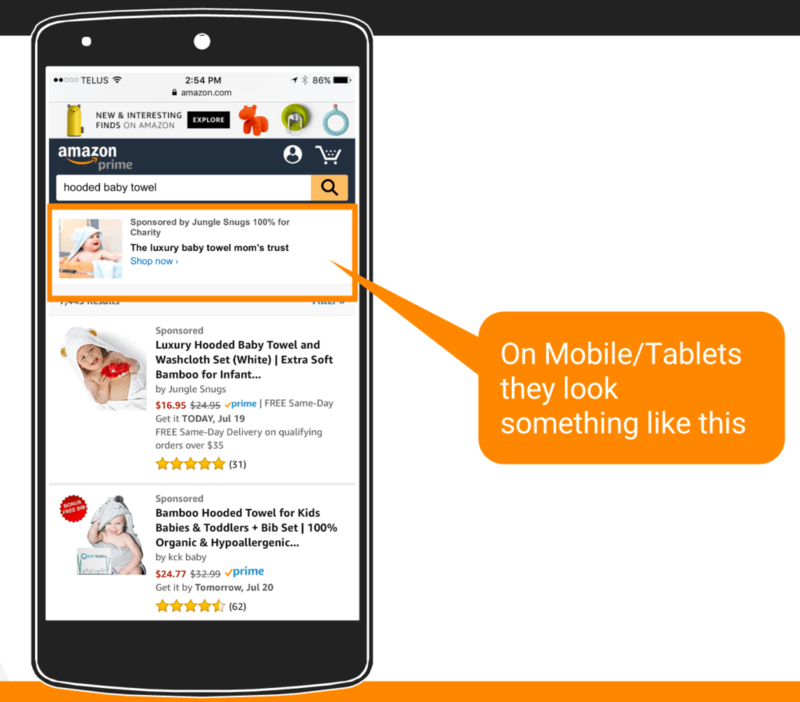 This week we are discussing Amazon Marketing Services (AMS) Headline Ads. This is part 2 of a two part series on Amazon Marketing Services. 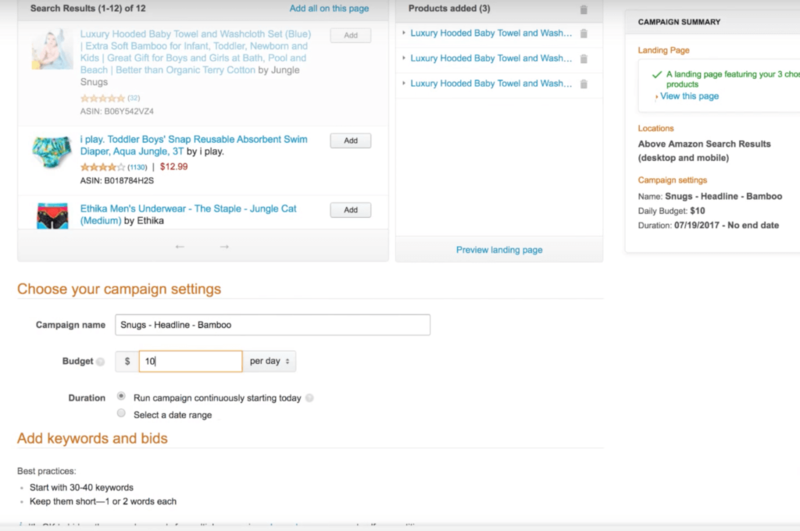 If you want to see Part 1 where Greg demonstrates how to qualify for AMS and how to set up and optimize Product Display Ads, you can see that here. In this session we’ll learn how to set up the Headline ads, how to optimize and improve them, and a peek into the Jungle Snugs account. This is some really good stuff, make sure you check this out if you are at the point of advertising for your product. Total units and sales in this six week period? So far we’re really happy with the progress, daily sales are climbing nicely even after just six weeks. 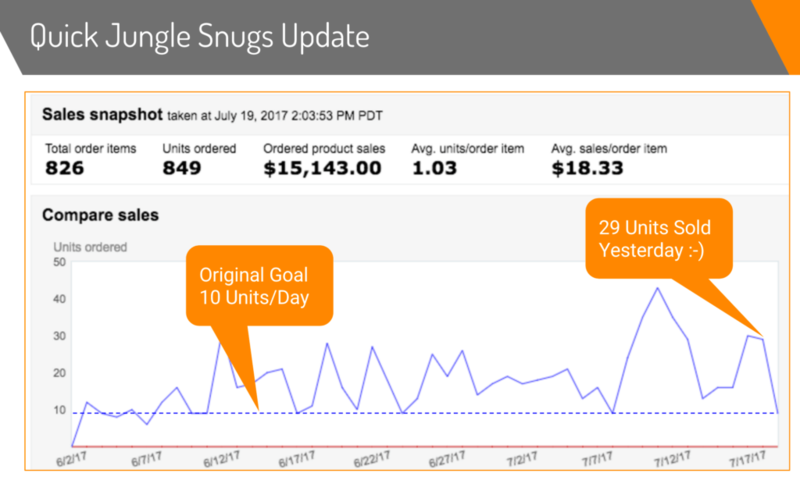 This shows that with the right launch strategy you can quickly see progress from your investment into a profitable product. You may remember from last week’s session, Amazon Marketing Services has been around for about a year. 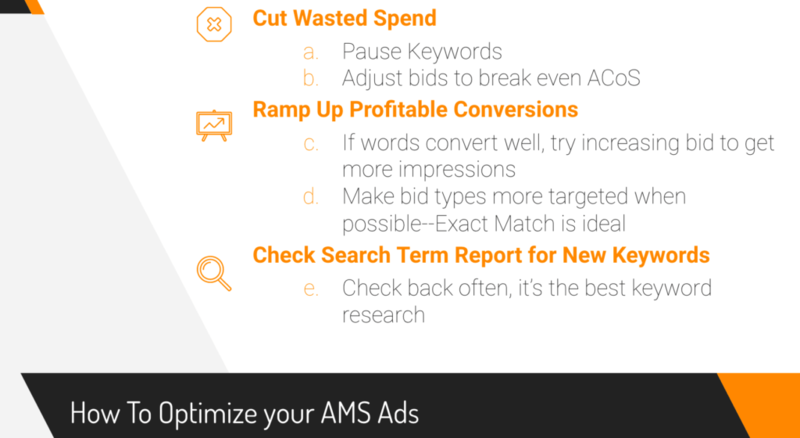 The extra ads you can run with AMS offer great visibility, appearing above the Sponsored Products and Organic listings. This week we’re gonna take a look at AMS headline ads. The nice thing about AMS ads is that you can create unique copy for your ads, instead of Sponsored Products which force you to use the image and copy from your actual product listing. This is a huge benefit as you can tailor your marketing messaging and even use images that aren’t featured in your listing! When formulating the copy, Greg shared some of the best practices for what has worked for him. 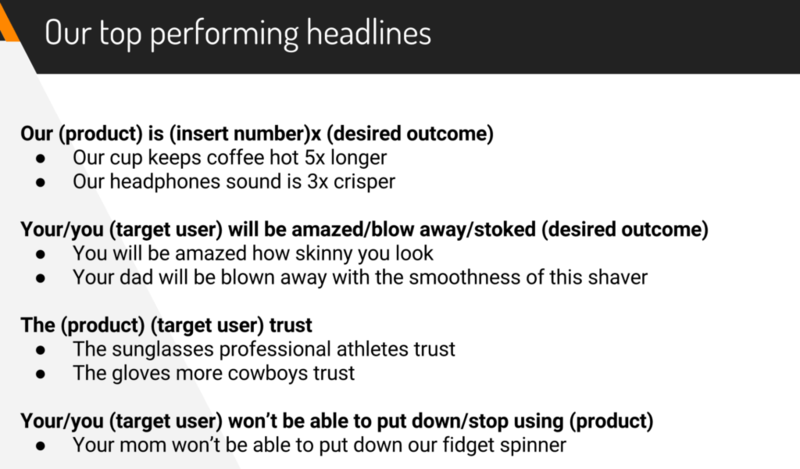 Here is an example of the formulas that Greg has put together that are helpful for successful headlines. You can apply these formula to almost any product. The most important concept to grasp is understand is: what is your unique value proposition to get someone to purchase your product? If you can match your messaging to your customer’s challenges and needs, you can skyrocket your likelihood of converting a sale! But how to do you know what your customers’ needs are? The Search Term Report of course! One of the benefits of investing in pay per click campaigns is that you gather actual customer search queries, and you can see which searches actually lead to sales. 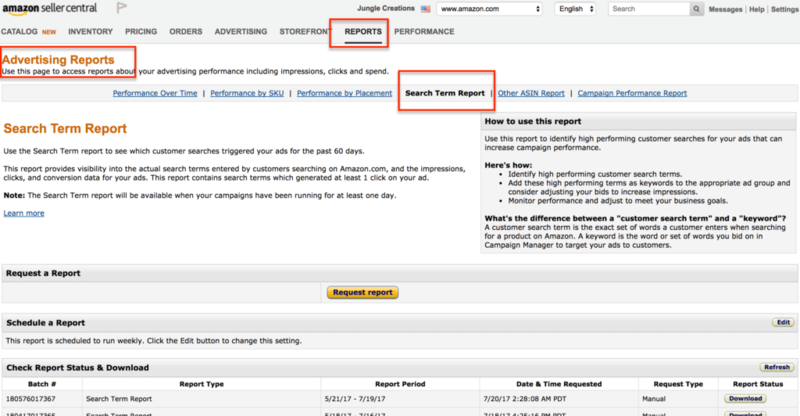 So if you are already running Amazon PPC campaigns (I would advise you do this before delving into AMS ads), then you have a whole reports worth of data sitting at your fingertips. These search terms are the best way to appeal to your customers and tap into their language. You can use their own voice to create ads that will speak to them. 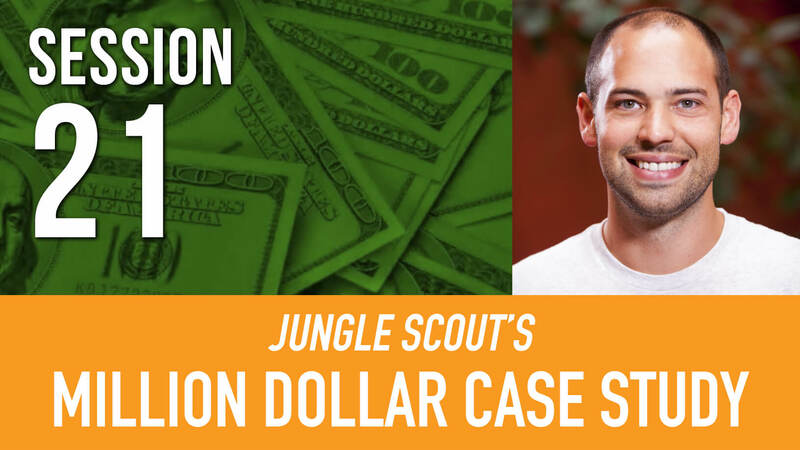 For example, there are a variety of terms that people are using to find and purchase Jungle Snugs, some of which were unanticipated yet profitable, like terms relating to beach towels. There are also several different words used to describe children (infant, baby, newborn, toddler). So straight away we can see that we have a different language being used in relation to our product. We can utilize this to create highly targeted ads groups with relevant ad copy. You can now get our keyword tool, Keyword Scout, in the Web App! As mentioned above, if you are able to gather and organize the data into highly targeted Ad Groups, then you can create very specific ad copy that addresses the customer’s exact needs based on their search term. This increases the chance of having your ad attract their attention, click, and ultimately purchase! For example, if they are looking for an “Organic” product, you want to play up the fact that it is in fact organic–healthier for your baby’s skin, hypoallergenic, softer, etc. Ultimately, you want to convey that your product fits their exact needs. One helpful tip is to filter the data. 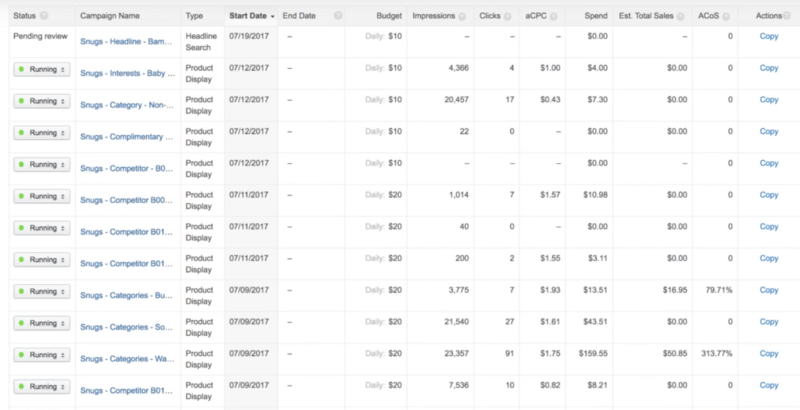 To do this, highlight the row of metrics (ie Row 1: campaign Name, Ad Group, Search Term, etc), go to the Data tab, then Filter. A helpful first step is to filter by Click Through Rate. This helps identify the most relevant search terms, as it generates the best customer interest, as measured by the clicks on your ad. You can filter out those that have less than 1 or 2 clicks, as it isn’t sufficient data and could be an anomaly. 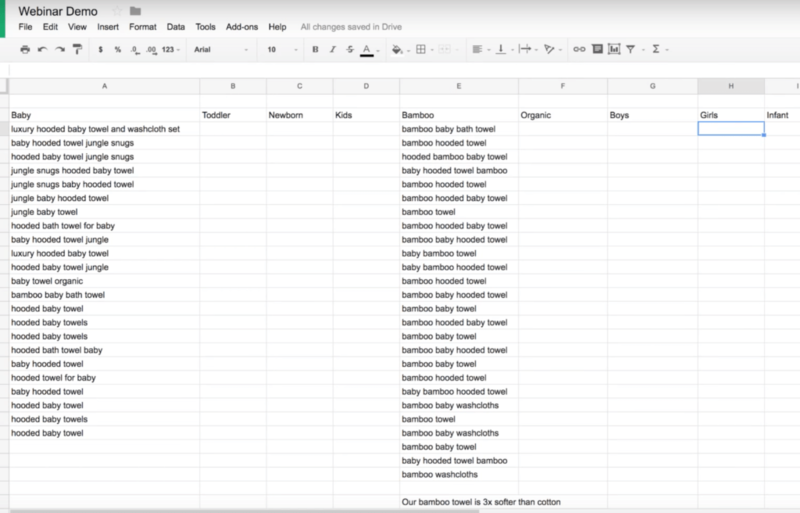 After you filter to find your most relevant keywords (as measured by Click Through Rate) is to organize the keywords into tightly-themed Ad Groups. This is important because each Ad Group has one version of sales copy that you use, and obviously you want to have the greatest relevancy possible. This maximizes your chance of getting the clicks, and the sales. So what would you want to tell someone who is searching for a particular keyword, like “bamboo towel”? Perhaps that it is softer or more luxurious than alternatives like cotton. Or if they are searching for “cotton towels”, then you want to educate them on why bamboo is better than cotton. 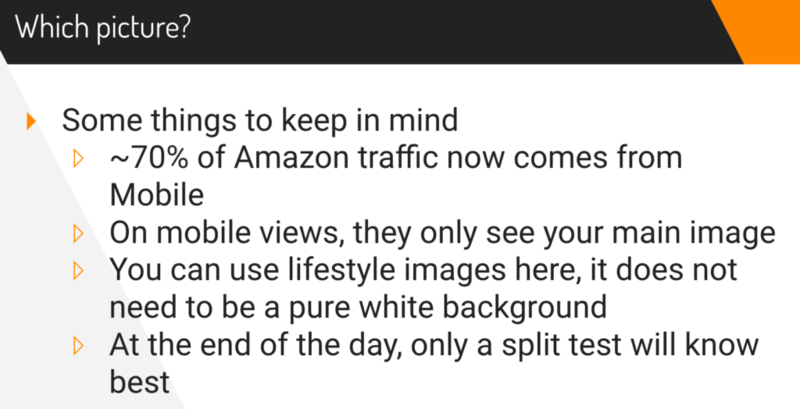 A nice benefit of Amazon Marketing Services ads is that you can use lifestyle images for Headline ads–it doesn’t need to have a pure white background. To see which image performs the best, it’s smart to set up multiple ads and test to see which has the best Click Through Rate and Conversion Rate. Next Greg walks us through the full process of setting an ad up. It’s really simple if you have already organized your ad groups, keywords and created your ad copy as described above. Top tip: One thing to note, as you can see above, is that your ad and the included images may differ depending on the device–desktop, mobile website, or mobile app. Just remember that it takes up to 48 hours for Amazon to report sales that your ads have generated, so don’t get nervous if your ACoS looks higher than anticipated, as maybe not all of the sales have been included. This will allow you to continually optimize and improve your campaigns and drive that ROI up! That concludes the two-part sessions covering Amazon Marketing Services. If you are still unsure having read these recaps, be sure to check out the video replays because in those, Greg gives you a super insightful over the shoulder view. Next week we’re moving on to inventory management. A very important and often overlooked part of running a successful Amazon business. If you are not registered, JOIN HERE to catch Inventory Management Best Practices next week! There’s no search term report available for headline ads, is it? And I know Amazon regards relevance between keywords and product information to determine the ad rank. Does Amazon evaluate relevance in the headline ad? No, I don’t believe Amazon offers one for HSA. However, you can probably estimate the metrics based on the data in your campaign editor. And yes, Amazon does somewhat evaluate relevance in the headline ads. I think they will bar certain keywords from being used if they don’t deem it “relevant.” I have this feeling HSA was developed by an entirely different team and Amazon’s using it as a way to test out another version of PPC! But who knows with those guys? They’re so whacky! I find the MDCS copy cats selling the same product humorous. My hypothesis is that their utter lack of creativity and their apparent laziness will ultimately lead to an unsuccessful business on Amazon and otherwise. Kudos to Greg for taking it so well. I think that sets and example and presents an important lesson for everyone selling on Amazon about how to deal with competition. I would like to ask though, in this particular case, is the amount and type (i.e. people following your every move) of competition worrisome? Do you have a strategy in place or in general about how to deal with competition? We think it’s great that people are inspired to start selling on Amazon after seeing the case study and hope that people find a way to launch products of their own, in niches where they find great opportunities. There is going to be a slightly elevated amount of competition with people following our every move. But our strategy is to move smarter and faster, and try new strategies that we have never before covered in our case studies. As Greg mentions in this session, it does mean we waste a bit of extra spend on things like advertising. But the good news is, this is not a true representation of what a seller would experience if they were launching in their own niche. Thanks for the kinds words and following the case study- stay tuned!